Ulnar polydactyly is out beyond the little finger. Radial polydactyly is out beyond the thumb. Intercalary polydactyly is between two of the normally expected digits. Ulnar polydactly is the most common form of extra fingers, followed by radial, with intercalary polydactyly occurring rarely. Polydactyly is a relatively innocuous condition when it is an isolated condition for a baby and can be treated simply in the office. Many physiciansd treat ulnar polydactyly by tying it off with a suture or clip, cutting off blood supply to the extra finger. The extra finger, much like the stump at a baby's belly button, will drop off but always leaves a tell tell sign of extra skin which persists into adulthood. Dr. Bastidas perfers to remove the extra finger sharply, under local anesthesia in the office , removing the extra fingers without leaving an obvious scar. This is performed pain free and is covered by insurance. 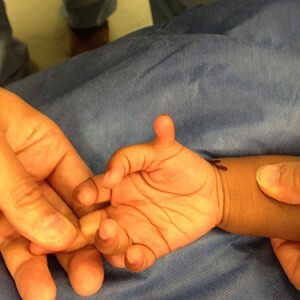 If the digit is more fully formed, based upon how the digit is connected to the rest of the baby's hand, particularly if there is bone or tendon involved, Dr. Bastidas' experience indicates that the more ideal age for surgically treating an extra finger is around the age of one year. Anesthesia is tolerated well at this age and in most cases Dr. Bastidas will perform this surgery at the hospital as a same day procedure rather than in-patient. The complexity of this surgery depends upon the specific biology of the extra finger and it is at this point that the extensive training and experience of Dr. Bastidas will provide you with the assurance that your baby is in the best hands possible. Dr. Bastidas is a founding physician of the Institute of Pediatric Plastic and Craniofacial surgery, a collaboration of physicians fueled by a passion for state-of-the-art care for their pediatric patients. Extra finger surgery may involve cutting through bones, ligaments, muscles or tendons and, if necessary, move or reconnect structures to normalize function and appearance. 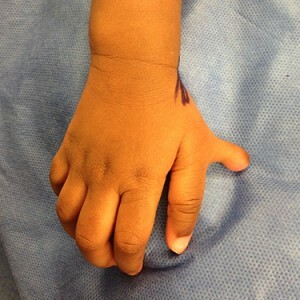 The more complex surgeries for extra fingers may require a baby to wear a splint or cast during the healing process. Dr. Bastidas may order Occupational Therapy (OT) to help with any swelling, scarring or stiffness. Dr. Bastidas' patients always benefit from his widespread reputation of excellence, no matter how simple or complicated the procedure he performs. Radial polydactyly requires reconstruction of the ligament of the thumb at the same time to improve the stability and pinch grasp. This is known as a Wassel deformity and can involve any part or joint of the thumb. If you are interested in learning more about Dr. Nicholas Bastidas' practice in plastic and reconstructive surgery, visit his website www.DrBastidas.com. Dr. Bastidas and his team are committed to delivering safe, high quality healthcare with excellent results for his patients. Dr. Bastidas finds that the treatment of birth conditions is some of the most rewarding work he does. Dr. Bastidas is eager to meet with you and help you to plan treatment for your baby's extra finger.